On Sunday, the Baltimore Ravens defeated the Falcons in Atlanta. At first glance, the win was not as impressive as the score would suggest. Sure, the Ravens defeated the Falcons by a score of 26-16, but the game was too close for comfort throughout. The Ravens barely led at halftime in a game that Baltimore simply dominated. The Ravens offense was moving the ball and the Ravens defense held the Falcons offense to a very restricted presence. But as the clock winded down to triple zeros, Baltimore was left with just 13 points on the scoreboard while the Falcons had 10. So what allowed for Atlanta to keep the game close when the Ravens dominated both sides of the ball? The answer lies in the game tape. After examination of the game tape, it became clear what the underlying cause of Baltimore’s woes was. Sloppy offensive play. The Ravens started off well, securing a Lamar Jackson touchdown run on the opening drive. The Ravens offense was powered by the run game. Gus Edwards was again the feature back, and he continued to thrive in the Lamar Jackson lead offense. The Falcons at times put a linebacker on a QB spy assignment, and often had the outside linebackers look for outside runs. As a result, Gus Edwards typically had a lane run up the middle. Lamar Jackson utilized the read option plays that offensive coordinator Marty Mornhinweg dialed up, and took the ball for long gains on outside runs. By the end of the day, the Ravens offense finished with 207 yards on offense. The scheme flashed success, but was ultimately unsustainable for the Ravens. After Baltimore’s first touchdown, the Ravens would not score another offensively. Instead, the unit would be resigned to four field goals. The Ravens consistently moved the ball, but were constantly undermined by their own mistakes. Quarterback, Lamar Jackson, fumbled the ball three times, and Kenneth Dixon fumbled once as well. All but one fumble was recovered by the Ravens. The one that was not was taken back for a Falcons touchdown. The Ravens lost yards when they recovered the ball, and it stalled out drives. Baltimore’s offense was also hindered by inconsistent wide receiver play. Both Michael Crabtree and Willie Snead dropped passes on key situations. Lamar Jackson showed some signs of growth as a passer, but still consistently failed to deliver through the air. Jackson’s decision making is still in need of improvement. Early on in the game, on the first drive, he found a wide open Michael Crabtree in the middle of the field. Jackson, however, threw a risky sidearm pass. The pass was complete, but the technique was bad. If Jackson can be consistent in making these passes, then it will not be an issue, but most quarterbacks cannot consistently hit on sidearm throws. Later on, Lamar Jackson tried to extend a play, but as he was being chased and no options were open, he opted to run out of bounds for a loss of four yards instead of throwing the ball away. Jackson also miss-fired on passes to wide open receivers throughout the game. In one instance, he had John Brown wide open on a post route deep. He shot the ball too far to John Brown to catch. If the ball was placed into his hands, Brown would have scored. Lamar Jackson was not the only reason the offense struggled. Lamar Jackson entered the concussion protocol in the third quarter, and Robert Griffin III got the chance to show off his abilities. Without Jackson, the Ravens again continued to move the ball, but again stalled out and were forced to kick a field goal. Even when the Ravens got creative, Baltimore could not punch in another touchdown. The Ravens called for the famous Sam Koch fake punt, where the veteran punter threw the ball for a first down completion to Chris Moore. 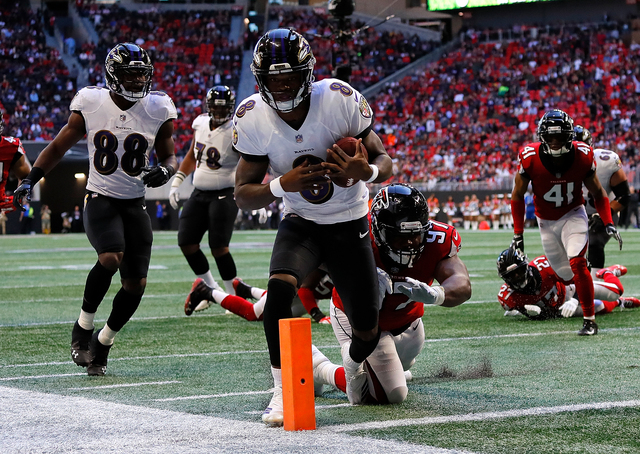 The Ravens got down into field goal range, but the drive failed as Lamar Jackson fumbled the ball, which was recovered and returned for a touchdown by Atlanta. Baltimore’s defense again bailed the team out. While the offense struggled to score, the defense kept Matt Ryan and the Falcons from taking advantage. Matt Ryan was kept to 131 yards passing, as the Ravens consistently played tight defense. Cornerbacks Jimmy Smith and Marlon Humphrey, in particular, were the best in coverage. Humphrey regularly broke passes up, while Smith did the same, but less frequently, as his tight coverage was enough to deter Ryan from targeting him often. Baltimore held top NFL receivers like Julio Jones, Mohammed Sanu, and even the rookie Calvin Ridley, to minimal success. Baltimore also bottled up the run game. Falcon running backs Ito Smith and Tevin Coleman were held to a combined 30 yards on 13 rushes. Ravens inside linebacker C.J. Mosley played a big part in this, as he constantly tracked down the running backs, and found them before they could hit the hole. Mosley was aided by defensive tackles Michael Pierce, and Brandon Williams, who were able to get off blocks and wrap up defenders. The Falcons offensive line was also bombarded with a staunch pass rush, led by the ageless Terrell Suggs. Suggs, Za’Darius Smith, and Patrick Onwuasor all got in on the fun, each with a sack. Onwuasor’s sack resulted in a Matt Ryan fumble, picked up by Tavon Young, and returned for a touchdown. The defensive effort was able to cover up for the offensive mistakes. The Falcons only scored 10 offensive points in the entire game. The first score came in the first quarter as the Falcons scored a field goal on the opening drive, and the second score came as the Falcons tried to jumpstart a comeback attempt in the fourth quarter. The defense was aided by the Ravens stout rushing attack, which kept the ball in Baltimore’s possession, and out of the hands of Matt Ryan. For comparison, the Ravens ran 77 offensive plays, while the Falcons ran just 45. The Ravens held the ball for 39:39, while the Falcons held it for 20:21. In all, the Ravens victory was solid, but certainly not flawless.